The Original Fan Site for the game No Man's Sky. | Click the MESSAGE FORUM link below and sign up to chat about the game. Sean Murray from Hello Games made the following announcement about the future of No Man’s Sky. Hello everyone, we know that there is a lot of hunger out there for news and updates on No Man’s Sky. We wanted to share some information from behind the scenes. Our next chapter will be called No Man’s Sky Beyond, coming Summer 2019. Each chapter for No Man’s Sky has been more successful than the last. Thanks to our community, our large release last year, NEXT, was especially so. It went on to bring enjoyment to millions of new players, and it helped to change the legacy of this game we care so much about. Earlier this year, while working on our roadmap of three future updates, we decided we wanted to interweave their features, and had a vision for something much more impactful. We are excited to announce that Beyond will contain those three major updates rolled into one larger free release. No Man’s Sky Online includes a radical new social and multiplayer experience which empowers players everywhere in the universe to meet and play together. 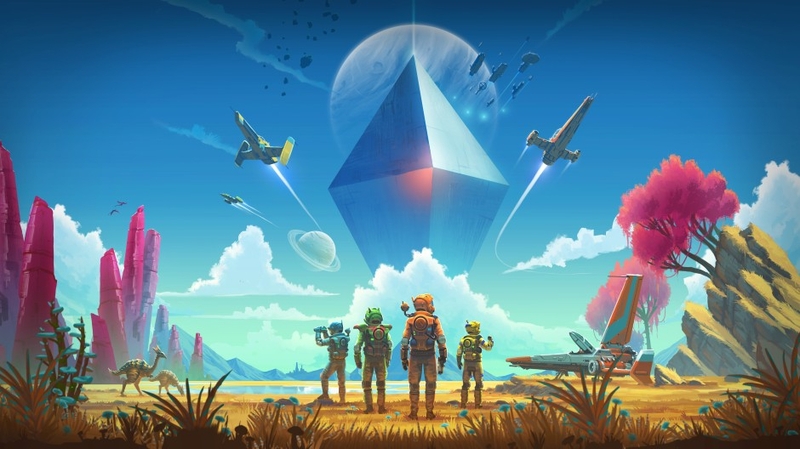 While this brings people together like never before, and has many recognizable online elements, we don’t consider No Man’s Sky to be an MMO — it won’t require a subscription, won’t contain micro-transactions, and will be free for all existing players. These changes are an answer to how we have seen people playing since the release of NEXT, and is something we’ve dreamed of for a long time. We will talk more about each component when we know we can be precise, and look forward to sharing more in the coming weeks. Check out these game play video’s of No Man’s Sky by Petreak’s Gaming World. The newest video released shows off a lot of the changes that is coming in the NEXT update for No Man’s Sky. It looks like it’s going to be an amazing update! The NEXT update for No Man’s Sky will finally arrive on Xbox and on the previous systems (PS4 and PC) on July 24th. It will have true multiplayer in the game for the first time. You’ll be able to explore the universe with a small group of friends, or bump into random travelers. You can help friends to stay alive, or prey on others to survive. Tiny shelters or complex colonies that you build as a team are shared for all players. Fight as a pirate or a wingman in epic space battles with friends and enemies. Race exocraft across weird alien terrains, creating race tracks and trails to share online. The new update is out for PC and PS4. In this patch, we’ve added a new tethered ship control scheme for PC mouse & keyboard players. This option can be toggled, and changes ship controls to be cursor based, meaning you’ll be able to direct your ship easily using your mouse. In addition, PC mouse and keyboard players can now look around the ship’s cockpit by holding the ALT key. This new option will be active by default, and can be toggled back to the original control scheme via the General Options menu. Players who find themselves a long way away from their mission destination can now use the log to reset the mission. The mission log will highlight missions and destinations over several thousand light years away with a red icon. Holding R3 or the middle mouse button over this icon will reset the mission to the most recent safe stage, allowing progress to continue. Fixed an issue where some players did not receive all of the portal glyphs. If you experienced this issue, the next time you find a portal glyph, those that were previously missed should be restored. Introduced ship handling variances between types/classes. Each individual ship now has procedural handling and speed characteristics, based on their type and class. Handling is now displayed as a value on the ship statistics screen. It’s now possible to craft multiples of the same product at once. Added the ability to craft more of the same product on top of an existing stack. Improved transferring items between inventories. Added a toggle to switch from buy to sell screen on the trading menu. Added variance in handling between ship types. Improved the appearance of popup menus. Improved speed and smoothness of user interface page transitions. Reduced the amount of resource required to repair tech in Survival mode. Improved visuals for editing terrain. Improved display of critical warning messages. Added message to notify the player if they select a portal glyph they have not yet learned. Added additional information to the quick menu when the player attempts to charge something with insufficient resources. The quick menu will now automatically close after selecting an option. Alien words which have been translated are now highlighted in interactions. Improved messaging when portal glyphs are rewarded. Improved user interface navigation using Q, E, W, S and A and D keys on PC. Added ability for player to enable torch while in caves. Improved galactic map saturation, colours and effects. Added an option in the galactic map to toggle user waypoints. Fixed an issue preventing players with very long play times being able to save. Fixed an issue where black dots would occasionally appear while looking into the sun. Added audio when interacting with portals. Prevented hazard effects showing while teleporting or warping. Prevented mission log opening when you unpin recipes. Prevented players being able to scan creatures through the terrain. Fixed an issue causing extremely distant points of interest to show when scanning. Removed large white marker which would occasionally show up permanently over buildings. Fixed an issue where visited buildings would not correctly update their icon. Fixed an issue where visiting a building would not correctly mark nearby waypoints as visited. Fixed an issue where scanning buildings would not also scan nearby waypoints. It’s no longer possible to lose the Atlas Path by using a black hole. Denying the Atlas Path will no longer show you the Atlas Path. Balanced the damage potential of the Scatter Blaster upgrade. Players will no longer be directed to the anomaly in systems where it can’t spawn (e.g. when an Atlas Station is present). Prevented portals from being incorrectly left enabled at times they shouldn’t be. Removed grass from bases created prior to the Atlas Rises update. Completed freighter salvage missions will no longer be incorrectly re-added to the mission log. Fixed issue where your base teleporter can be duplicated and incorrectly labelled in teleporter location lists. Prevented incorrect distant paths being drawn in the galactic map. Fixed an issue where galactic map paths would draw incorrectly. Fixed an issue where players could manipulate mission boards to get multiple of the same mission type. Fixed an issue where system race was being displayed incorrectly when talking to mission NPC’s. Fixed an issue that caused general ship handling to overly effect ship boost handling. Spoiler warning: Fixed an issue where some players were not rewarded the Remembrance recipe at the conclusion of the story. Prevented the terrain editor draining in charge when editing empty voxels. Prevented players being able to edit terrain outside their base radius for free while standing inside their base. Fixed responses made to Artemis and Apollo at times being incorrectly tracked. Prevented players being blocked from progressing if they decline to enter glyphs into a particular story portal. Fixed instances where Atlas text was appearing as though it came from an NPC. Fixed FoV in photo mode showing degrees as a temperature. The discovery screen will now show images from a larger number of visited waypoints. Added a placeholder image in cases where a waypoint image is not available. Allowed scrolling of names on the discovery page which are too long to be displayed. Fixed a graphical issue where a blur effect would be applied while teleporting. Improved prioritization of systems you have teleported from when listing your most recent teleport locations. Altered teleporters in space stations to allow players to teleport directly to other stations as well as to their base. Improved ordering of icons on the galactic map to more accurately indicate missions and system information. Increased maximum number of paths which can be rendered in the galactic map. Improved appearance of the message displayed when your starship is out of range. Fixed warning symbol on broken tech appearing too small. Fixed an issue that sometimes caused glyphs not to be awarded correctly. Fixed an issue in tutorial messaging when you repair your pulse drive but nothing else before entering your ship. Added the amount of units you will earn for a discovery to the Analysis Visor interface. Added correct emotion animations for various interactions with NPC’s. Fixed an issue when claiming a new base location (which caused base NPC’s to stop responding). I went through a portal and met 2 other players on the other side. One was named ll-FooFighter-ll and the second player was DJNephilim. Check out the video below to see what it looks like. Click the link below to go to our message forums to discuss the video or to say hi if you were one of the people in the video.